The L-2 and L-4 planes were based on a 1930 design originally called the Taylor Cub. After watching a bumpy landing by the plane, General Issis Swift nicknamed it grasshopper. Between 1941 and 1945, the Army Air Corps bought nearly 6,000 of the Piper L-4s for use as observation aircraft. 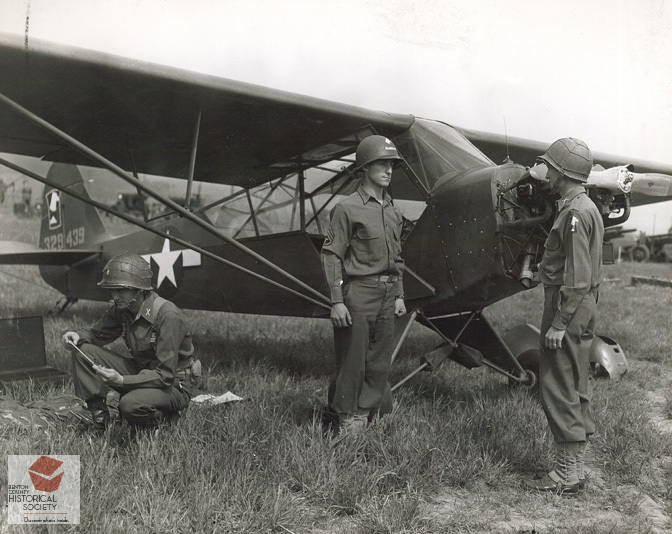 This photo appeared in the Camp Adair Sentry with the following caption: "Tec3 Arthur Nardini stands before the flying jeep of which he is crew chief. Lt. Horace Meyers and Lt. Joseph Wright are the inspecting team."